Jani-King of Columbus has just finished up the install of their new wrap. A brand new Ford Fusion is rolling around central Ohio sporting a striking new graphics package prominently displaying the Jani-King logo. The Jani-King brand specializes in cleaning services of all kinds and is available for Columbus and the surrounding areas. 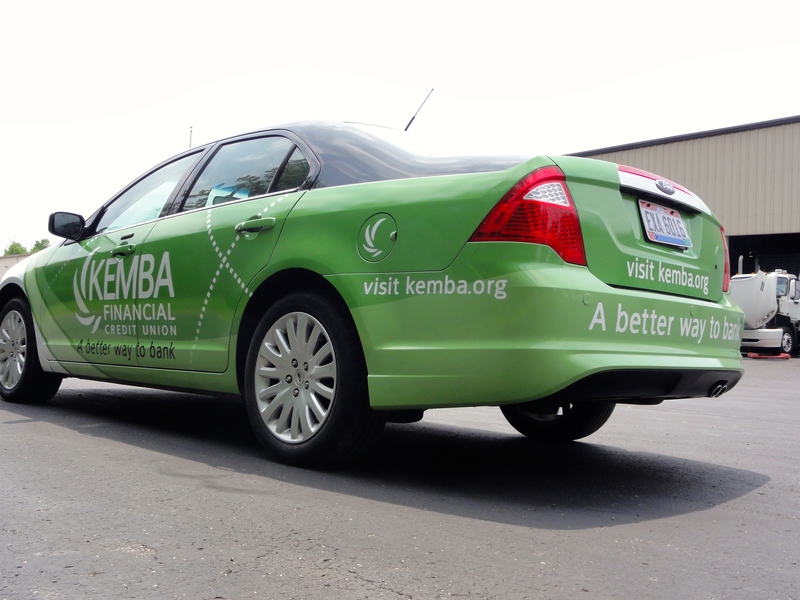 KEMBA Financial Credit Union just worked with us here at Pro Sign and Graphics to get a partial-wrap on their vehicle and what an impact it makes! Leaving the body color of the car exposed in places can not-only save you money, but also creates a great visual impression. 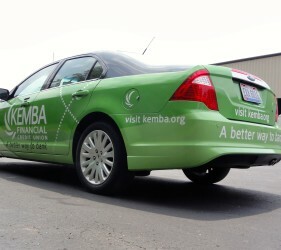 KEMBA is a local credit union here, in the Columbus, Ohio region that really helps people with their financial needs. For a lot of us here in central Ohio there are few things as exciting as the start of The Ohio State University‘s football season. Come fall, it is time for tailgating at the Ohio Stadium and enjoying some of the country’s best football with family and friends. Good food, good company and good college football… what more could anyone ask? Pro Sign and Graphics was honored in 2013 to get the opportunity to wrap the new food carts for the Ohio Stadium We got the call with very little time before Opening Day so we had to quickly swing into gear in order to handle the 16 units needed at the last minute. While it was a lot of work it was a lot of fun to bring the Pro Sign and Graphics team to the stadium in order to complete the wrap installations. Needless to say, traveling the massive concrete concourses from cart to cart while witnessing the team on the field getting prepared for the season was quite a treat for a Buckeye Fan. Gigi’s Cupcakes has come to Columbus, Ohio. The national cupcake phenomenon has been profiled all over the media for delivering its delicious cupcakes and local flavor. When the owners of the new stores here in Central Ohio brought us their new Fiat 500 we jumped at the chance to do a real fun, colorful wrap on a distinctive new car. The graphics were printed in-house on one of our HP L25500 Latex printers using 3M’s new Envision 480c wrap film with the component matched 3M 8548g gloss laminate. Our course the 3M Certified installation was completed here at Pro Sign and Graphics as well. We think the result speaks for itself. 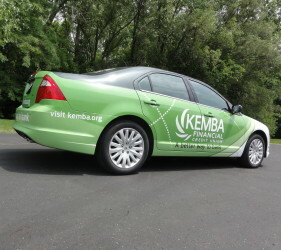 Fleet Graphics mean a fast turn around … want to do it in style? 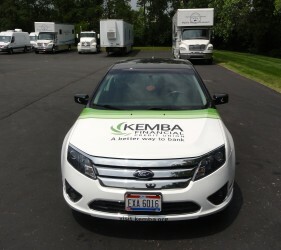 Oftentimes a fleet graphic project involves multiple vehicles & drivers coming in and out of a shop during the day. 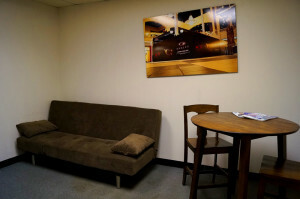 When the necessary work will only take a few hours the drivers can get stuck with deciding between leaving the vehicle (while finding someone to pick-up / drop-off) OR sitting in a hard chair in some lobby waiting for the work to be completed. Pro Sign and Graphics has created a great space right here in our large, indoor, alarmed & insured facility to make it much easier to decide. Our waiting room has a coffee house feel where folks can hang out & get some work done while they wait. With wireless access they can fire up the laptop to do some paperwork while taking advantage of the various drinks available. Would you rather just sit back and hang out for bit? Feel free to turn on the TV or bring a couple of DVD with you and watch movies… no problem at all here. 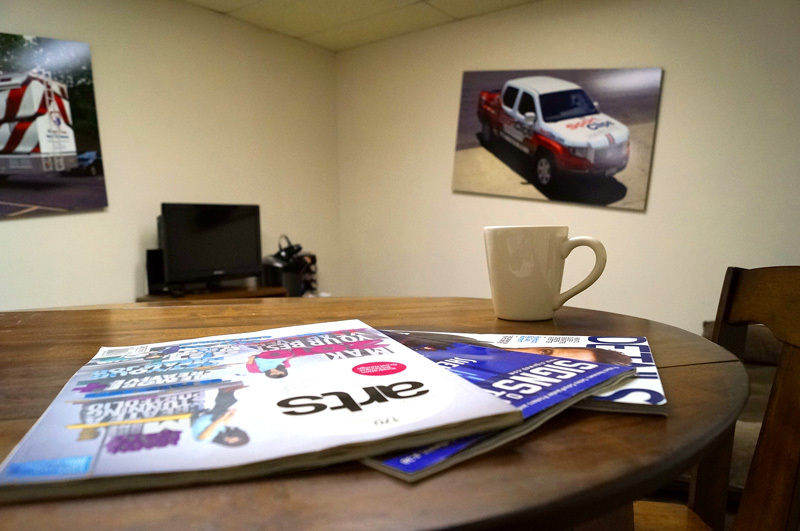 At Pro Sign and Graphics we try to make the entire graphics experience as easy as possible for you AND your crew. 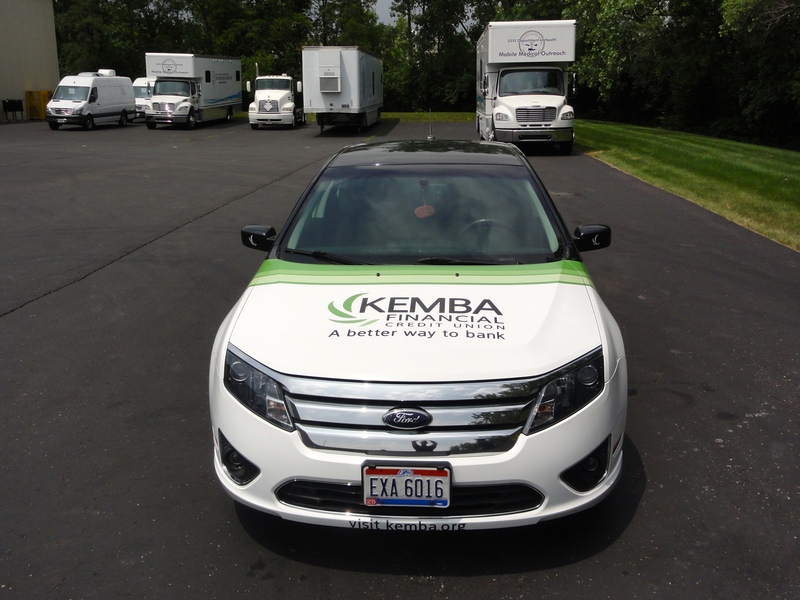 By choosing us to handle your fleet graphics & vehicle wrap installations you can be confident that you are working with a company who understands the needs of everyone involved. Why 3M Certified … and why do I care? 3M Certified Graphics Installation Company… has a nice ring to it but what exactly is it? Is being 3M Certified just another bogus “title” that anyone with a printer and some vinyl can buy? Is it just a graphic with the 3M name on it? What exactly does this have to do with you and why should you care? It just so happens, I have some answers for you. First and foremost, 3M is a multi-billion dollar international company with products ranging all over the board. In the sign & graphics game, 3M is the industry leader in vinyl films, wrap materials, graphic films, laminates etc. While there are plenty of other material suppliers out there, 3M is generally regarded as the Cadillac of materials. Incredible quality, ground breaking Research and Development and the best reputation means everyone else is simply playing catchup. It stands to reason that when you have a reputation like 3M it is in your best interest to make sure your products are being used and installed in the best manner possible. 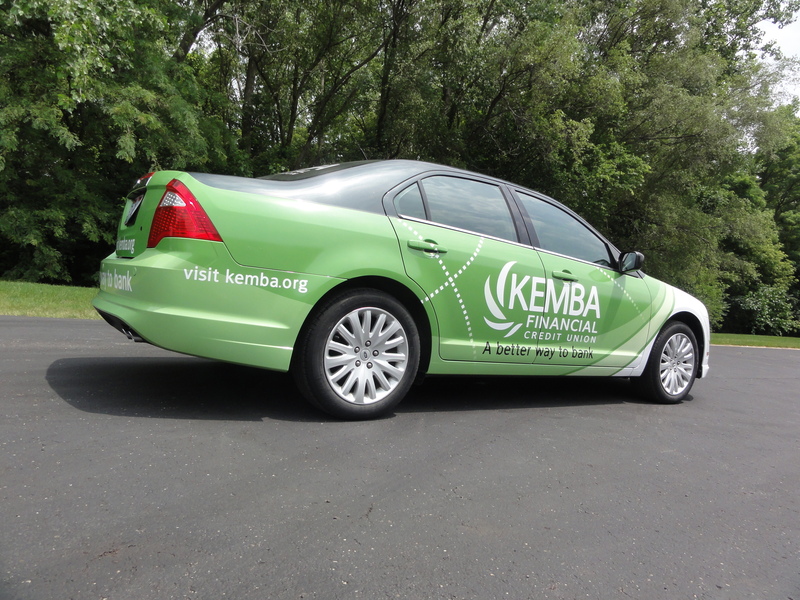 Even a wrap printed on the best 3M film can give the company a bad name if it is installed poorly with bad results. What you need is a group of experienced, qualified and thoroughly tested installation experts… a 3M Certified Graphics Installation Company. To even be considered, 3M requires 3 years minimum experience, validated business practices, confirmed liability and insurances as well as an extensive and rigorous two days of hands-on testing & judging. To say that a 3M Certification has to be earned is an understatement. So, what do you get with your 3M Certified Installer? You get peace of mind knowing your wrap was done properly with the best results possible. You know you get the best warranty in the world and the knowledge that your investment in graphics will last. In short, you get unparalleled value that you can count on. No matter what your graphics project is or where it needs to be installed you can call Pro Sign and Graphics to help.